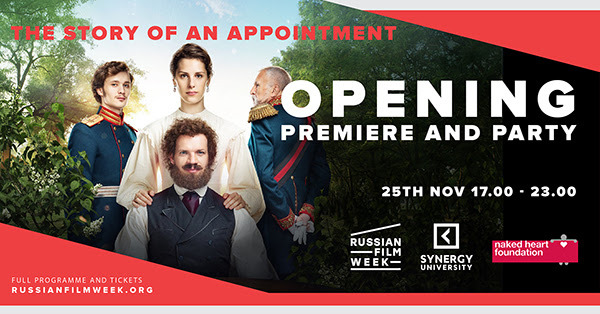 Russian Film Week opened on Sunday, 25th November with a screening of the drama ‘The Story of An Appointment’ by Avdotya Smirnova at Empire IMAX Leicester Square. All 750 seats of one of the most famous cinemas in the UK, were sold out. “We are expecting a record number of visitors this year,” said Filip Perkon, Founder and General Producer of the Russian Film Week at the press conference yesterday. For comparison, the first Russian Film Week was attended by 4,500 people and the second - by 10,000. Thus, in the three years of its running, the Russian Film Week has made it into the top five of the United Kingdom’s biggest national film festivals. Avdotya Smirnova, director and screenwriter of The Story of an Appointment, outlined the importance of the Russian Film Week’s mission to build cross-cultural bridges between Russia and the UK. Speaking about the film, she said she would be interested to see how the film will be perceived by British viewers. “I hope that Leo Tolstoy's personality, which reflects in the film will attract an international audience. Moreover, one of the greatest Russian writers is only 38 years old in the film. So in any case, this is the youngest Tolstoy in the world of cinema,” Avdotya Smirnova said. The press conference was followed by the Russian Film Week opening night at Empire IMAX. The screening was followed by a Q&A and after-party at the luxury W Hotel, where food and drinks were served into the night, whilst listening to the tunes of The Penelopes, the Cannes Film Festival band and DJ Duo. “In past centuries the world admired the Russian ballet, which became our national pride. Today's opening ceremony, which was attended by so many guests, gives the belief that our cinema will soon conquer the same bar and take its rightful place in the world culture,” Vadim Lobov, the Russian Film Week Co-producer and Synergy University Executive Director Vadim Lobov. The third Russian Film Week will run until December 2. During the eight-day festival, 68 events will be held across four cities – London, Oxford, Cambridge and Edinburgh. Besides the opportunity to see new Russian film releases, visitors of the festival will have the chance to meet Russian filmmakers and industry experts at numerous Q&A sessions, masterclasses, workshops, seminars, public talks and film art exhibitions. This year’s list of high-profile guests includes Vladimir Mashkov, Konstantin Khabensky, Danila Kozlovsky, Fedor Bondarchuk, Avdotya Smirnova, Marina Zudina, Ivan Okhlobystin and other experts of the Russian film industry. The festival culminates in the Golden Unicorn Awards ceremony designed to recognize excellence in 9 nominations, including the Best Foreign Film about Russia. The international jury will be led by renowned British and Hollywood actor Brian Cox. Russian Film Week 2018 is supported by the Russian Ministry of Culture, the Russian Ministry of Foreign Affairs, Synergy University, Blavatnik Family Foundation, Gazprom Marketing and Trading, British Film Institute (BFI), TV3, Russian Export Center and Renovatio Entertainment.